Anoushka Shankar: A Sitar Player In Andalusia On her new album, Traveller, Shankar goes back in time to make connections between India and Spain. "There's a very primal, emotional response I feel when I hear flamenco," sitar player Anoushka Shankar says. "It's quite in the belly in a way." 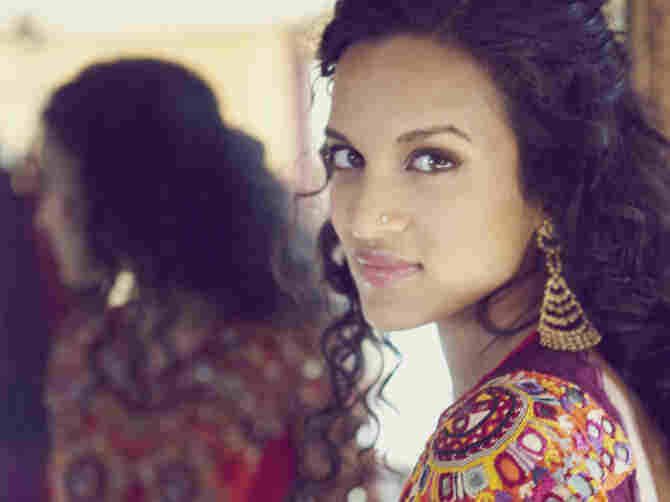 Anoushka Shankar is the daughter and protege of the renowned Indian sitar player Ravi Shankar, who is credited with introducing Indian classical music to Western audiences. Now, Anoushka Shankar carries on this tradition in more ways than one. On her new album, Traveller, she goes back in time to make the connections between India and Spain. The younger Shankar took the stage at an industrial Berlin nightclub late one Tuesday night. It's not where one might expect to find the sitar, but she loves clubs and she loves electronic music. On previous albums, Shankar has often pushed her classical training into slithering digital soundscapes. "I do think evolution is an important aspect of keeping a tradition alive," Shankar says. "If it freezes and remains very static in its form, it dies, and so a natural evolution has to occur." On her latest album, the 30-year-old Shankar moves her sitar out of urban lounges and into the winding alleys of Andalusia, in search of the musical and historical ties between India and Spain. "There's a very primal, emotional response I feel when I hear flamenco," Shankar says. "It's quite in the belly in a way." There's a reason she feels that connection. Flamenco traces its roots to the music of India, in the traveling communities that moved across South Asia and the Middle East, settling in Europe. "We tend to overprivilege this time as unique," says Sonia Seeman, an ethnomusicologist at the University of Texas. "That was a period of dramatic exchanges. The 15th century was a period in Europe when great prestige was given to travelers. Pilgrims were considered sacred guests, but they were given safe passage, and also food and places to stay." And, of course, they brought their music. As a result, there are technical links between Spanish and Indian music: the use of certain rhythmic cycles; the complex interplay of vocals and strings; and, as Anoushka Shankar says, something deeper. "It is that kind of space, that little space of longing, whether it is in something like romantic or divine love, something that is not quite in your grasp — a very powerful place to explore as an artist," Shankar says. "It can be a joy. It has this pang that is something that kind of brings alive what you are playing and what the listener connects to." Shankar is careful to call Traveller not just an album, but a musical project. These are original compositions, worked out during months of experimentation in Madrid — and still being worked out in concert performances. Some of these experiments are more successful than others and, as Shankar says, her favorite is not a blending at all, but a simple back-and-forth duet between her and flamenco guitarist Pepe Habichuela. "We were having a hard time trying to figure out what to do together, and we were wanting to play something very beautiful, and we kept running into this wall of having to break the other's form," Shankar says. "And, after much experimentation, we found an old form called the granaina, and we discovered a particular raga that I could play very freely and in only this particular key. It would match the granaina form, and so he was able to play a purely granaina form while I was able to play a pure raga form, and yet together it sounds like a very synergized and cohesive piece of music. I found it very beautiful that those two traditions could be very symbiotic." Anoushka Shankar's father brought Indian music to the West through his collaborations with classical and jazz musicians — and, of course, his association with The Beatles. But Shankar says she's wary of sharing her own experiments with her 92-year-old father. "He could even just twitch a smile and frown, and it's totally going to send me running," she says. "I'm going to think it's not good enough." Both Anoushka and Ravi Shankar are carrying on a centuries-old tradition in their own way. "I do feel a commitment to this art form and to my father's teachings, and the older I am getting, the more I am feeling it," Shankar says. "I have been given something really, really special and really unique, and it is not just in and of itself having learned from my father, who is the greatest exponent of this musical style. But it is an oral tradition that is only generally passed on in that manner, and so without the people who continue to ... learn it and perform it, it dies. And so, in that sense, I feel a great sense of wanting to share the music with people and push it forward." That movement of music across nations and time is what Anoushka Shankar's latest album is all about.